Every disappointment presents an opportunity and that is what happened with the January BE Group as our guest speaker could not attend, we had a Talking Circle where YOU are the speaker! 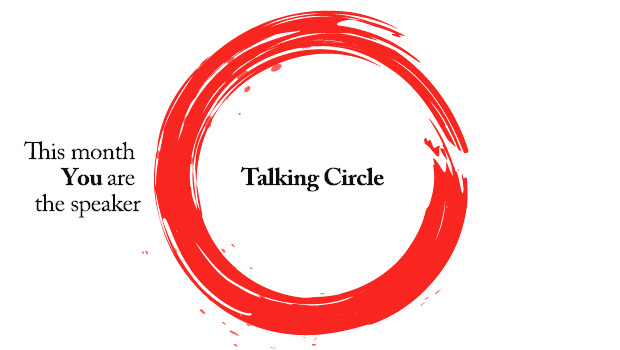 The idea behind the circle was to show how we had synergies among one-another that we may not have been aware of as our daily lives go on without noticing or getting to know the person sitting next to you. The weather was pretty cold that night so I didn’t expect a big crowd, but Cedric Red Feather and Janet Red Feather attended from Anoka and Shakopee and the evening became alive! So, as our guests began to arrive, some of them knew of the change that had occurred and others did not. So I would like to share some of the evening. The evening provided laughter, compassion, tears, and a range of other emotions as we all identified with each speaker…but there was one thing that happened that was truly amazing! One of the guests did not know that the evening venue had changed and arrived unaware of what changes we had planned. She also didn’t know that Cedric had planned on attending. She shared that she wanted to come to the BE Group but her friend couldn’t make it and asked her husband to join her, promising he wouldn’t have to talk…that made us laugh for sure as he was now “the speaker” upon his turn! And I might add that he executed it beautifully. However her story was one that showed me how spirit works when we’re not even aware of its guidance. She told a story of herself as a young girl entering the convent. While in the convent, she was sent to Fort Berthold, North Dakota to work with the Native American tribe known as the Mandan. She had stayed among the people for approximately one year. Cedric, who is Mandan, knew many of the people that she knew! What were the chances of that?! Other stories were richly shared with insight, bravery and warmth. After we all spoke, Janet Red Feather who is a woman of many talents such as attorney, teacher, writer, tarot card reader and singer shared her beautiful voice with us all by singing in multiple languages! Even Cedric joined in and sang a couple of songs. The warmth that was felt that night here in an ordinary setting in such a non-ordinary way, was beautiful and spirit-filled and proved to me, when you think you know what might occur, YOU DON’T! Expect the unexpected at Wind over Fire!